Now, you can serve drinks to your guests and clients in this beautiful wood drink trolley features an antique globe nautical design. Cabinet is made of wood with round carved wooden floor stands on the wheels. 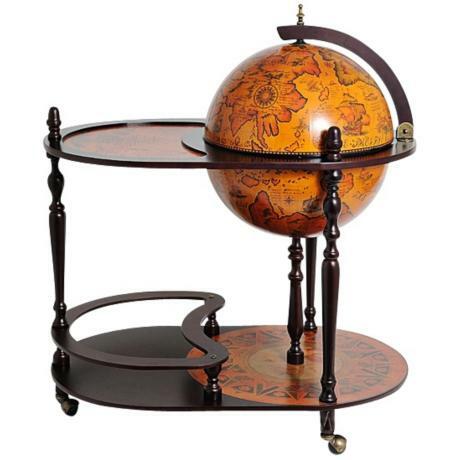 Lift globe to reveal the hidden drink cabinet and a highly decorated interior. Glassware and bottles can be placed at the bottom shelf as well as inside the globe. • Nautical style drink trolley. • Dark red mahogany finish cabinet. • Featuring an old nautical map on the surface. • Globe is 16 1/2" wide. • Overall dimension are 32" wide, 20" deep and 36" high. • Some light assembly required.